Looking at my children now, it is hard to believe I was ever able to carry them around in my belly. This was sort of hard to believe the moment I laid eyes on them, now that I think about it.But dim memory and ample wide-screen photographic evidence suggests that I once did keep them in my midsection.They were good-size babies, and maybe as a result I tended to be slightly anemic while they were under construction.This led to talk of iron supplements.Supplementing with iron is a tricky business; it messes with your digestion something awful, and many believe this is due in part to the fact that non-dietary sources of iron are basically indigestible and consequently unavailable to your body--so you mess things up for no good reason, in the end.My midwife tried me out on a liquid herbal iron supplement that was food-based, but to my pregnant sensibilities it tasted like a juicy blend of marmalade and loose change and I could not choke it down.So to shore up the boost I got from eating like Popeye and cooking in a cast iron pot, I drank molasses.Not straight, mind you, but rather in hot water with a little soy milk.It must have been good for me, because it tasted heavenly and I sucked it down. Molasses, proceeding as it does from the same source as sugar, can get a little collateral bad rap--but molasses is essentially all the nutrients that have been sucked out of the sugar, in concentrated form.Regular and dark molasses are what’s left after the first two stages of“purification,” and blackstrap molasses comes from the third boiling.Whopping amounts of calcium, potassium, magnesium and iron course through all of them.According to various unvetted sources, it’s reputed to cure cancerous tumors, fibroid tumors, anxiety, constipation, edema, heart palpitations, anemia, arthritic pain, joint pain, acne and will reverse the graying of your hair, should you be experiencing any of that.Let’s just say it’s good for you. If you don’t feel like drinking it, I understand completely.How about gingerbread instead? In muffin form, so you can tuck it into your lunchbox or your mouth with equal economy of motion.Small children can put away a large number of these muffins, which tells you something about their appeal.Please note they do not give you the crested, bakery-window top of other muffins, thanks to a high proportion of liquid ingredients.But thanks to their flat tops they will sit still nicely for a dab of cream-cheese frosting, if you want to throw caution to the wind and call them cupcakes. Please also note that you can get pretty creative with the dry ingredients here. I substitute flax meal, wheat germ, oat flour and/or almond meal for some of the flour, and usually use a mixture of white and whole wheat flours as well. If they are going down easy, they may as well bring some nutrition along. Preheat the oven to 350 and line a twelve-cup muffin pan with paper liners. Mix the oil, egg, molasses and applesauce together well in a medium size bowl. In another bowl, combine the dry ingredients thoroughly. Combine the two mixtures, divide among the muffin cups and bake about twenty minutes. 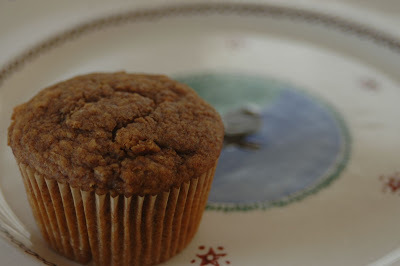 These keep quite well, tasting not at all like day-old muffins when or if they reach that age.